Acalypha rhomboidea.M. B. Gargiullo (ca. 2008). Acalypha rhomboidea is an annual herb, to 60 cm tall, from a taproot, stems erect, simple or branched, smooth or finely hairy; bright green to reddish, often appearing translucent or succulent, sap watery; senescent plants often turning reddish. 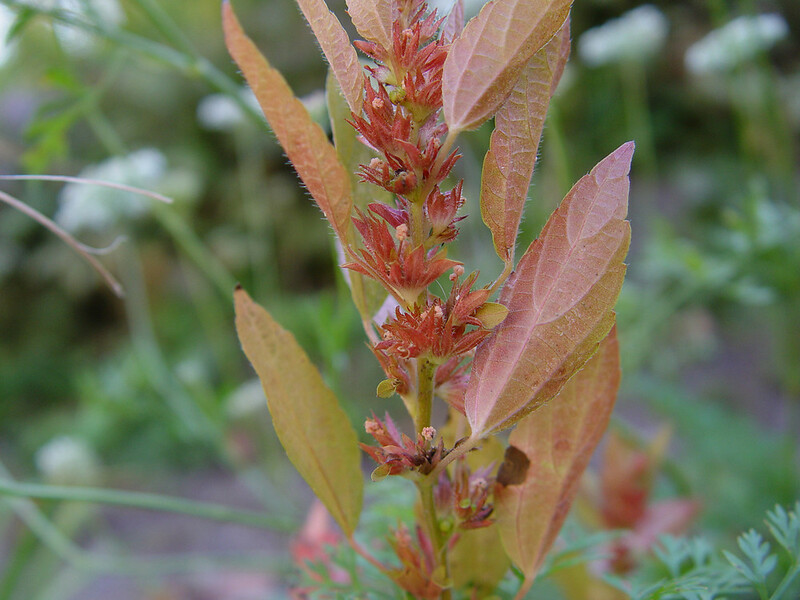 Leaves alternate, stalks 1-8 cm long, blades 3-9 cm long, 2-5 cm wide, only slightly longer than stalks, narrowly egg-shaped to rhombic, tip blunt, base tapered to rounded, surface finely hairy, major veins 3, palmate at base, margin bluntly toothed (crenate), new leaves often reddish. Acalypha rhomboidea (bract). By Keir Morse. 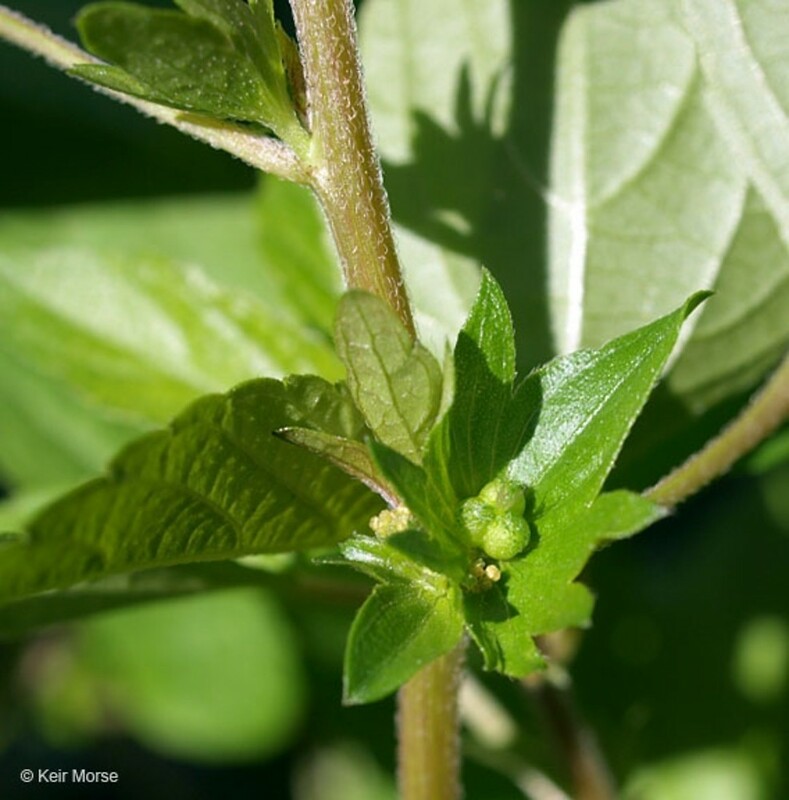 Copyright © 2016 Keir Morse.www.keiriosity.com.New England Wild Flower Society.gobotany.newenglandwild.org (Accessed 8/2016). above (subtended by) bracts to 1.3 cm long, 1.5 cm wide, glandular-hairy (stipitate glandular), margins 5-9-lobed, lobes (teeth) 0.5 cm long, tips pointed; male flowers in a head-like cluster at tip of spike, stamens numerous; female flowers 1-5, at base of floral spike, no petals, sepals minute, styles 3, ragged (laciniate), ovary 3-lobed; wind pollinated (Cid-Benevento 1987); blooms and fruits July-Oct.
Fruit dry, a 3-parted capsule about 0.2 cm wide (Radford et al. 1968;Yatskievych 2006); seeds 3, with fleshy attachment (aril), usually an indication of ant dispersed (Handel 1978; Handel et al. 1981). Acalypha rhomboidea.flowers. By Donald Cameron. Copyright © 2015 Donald Cameron (Accessed 3/2015). Habitat: Disturbed forest understories, edges, shady lawns, gardens, roadsides (appears similar to Pilea pumila, which has opposite leaves).